"What kinds of games do you like?" Adam "Atomic" Saltsman asked of his panel audience at the Canabalt postmortem during the Game Developer's Conference in San Francisco. "Role-playing" was yelled out, as was "puzzler," and eventually Saltsman picked "platformer" as the genre. Without another word, he quietly went to work on a laptop. Then, his partner at Semi Secret Software, Eric Johnson, took the podium to tell us all about what it was like to make one of the App Store's most popular games. He started by saying that the game was originally developed in just "five very long days," and was created for the Experimental Gameplay Project and based around simplicity -- it only uses six colors and, obviously, the one button. For a game that's so simple, it actually had a lot of complex influences. It drew from older games, like Another World and Flashback, as well as modern works, like Half-Life 2 and District 9. The level design was originally assembled around the idea that "the farther you go, the harder it gets," but they later evolved the difficulty to be based around the player's running speed, so that, to an extent, you could self-mediate the difficulty by hitting obstacles and slowing down a bit. 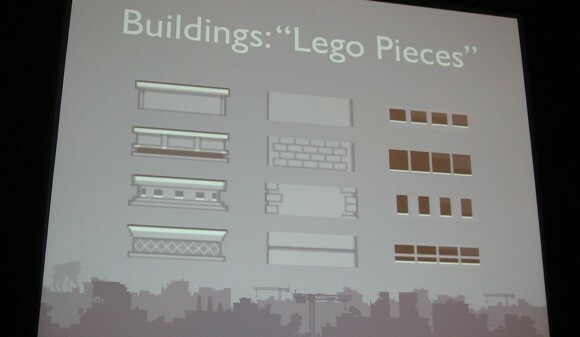 The buildings were all designed with what Johnson called "lego pieces" -- little bits of graphics that are interchangeable to create somewhat randomized designs. Jackson also talked about what he said might be the most inventive part of Canabalt: the marketing. The game was originally designed as a Flash game, and throughout the entire time the game was available for $2.99 on the App Store, there was always a free complete version available online for the public to play. The developers were OK with that, however, for three reasons. First, they said, there was no Flash on the iPhone, so if you wanted to play the game on the iPhone, you had to buy it. Second, there was a "try before you buy" element that a lot of people liked, and that they believe sold some games for them. Third, they figured some people would buy the game just to support the developers, especially because of the Flash game. Jackson said no matter what the reasons, having a free Flash version to play worked great for them (they shared that they'd sold 115,000 copies on the App Store in just five months), and while the server costs of keeping a popular game up online are not insignificant, Semi Secret Software will continue to do the same thing with their future games (in fact, you can currently play Gravity Hook HD, their next game, online right now even before it's released on the iPhone. The other decision they made on marketing was with price -- despite calls to the contrary, they decided to stick with the $2.99 price on the iPhone. That proved to be very "polarizing" -- almost all of their App Store reviews mentioned the price, both positively ("this is totally worth the money") or negatively ("How dare you charge this much"). They believed that while they would have sold more copies at 99 cents, the $2.99 price gave them a different type of customer, and as they showed with the chart below, they got a different type of reviewer. Free apps, they said, tend to attract a lot more negative reviews in general, while people who pay for paid apps tend to take a little more "ownership" in the game they support. Finally, the guys announced their brand new development kit for the iPhone, called Flixel. The app, which they're bringing into a closed beta right now but will eventually release publicly for free, is designed and used by the guys to bring Flash games right over into the iPhone. 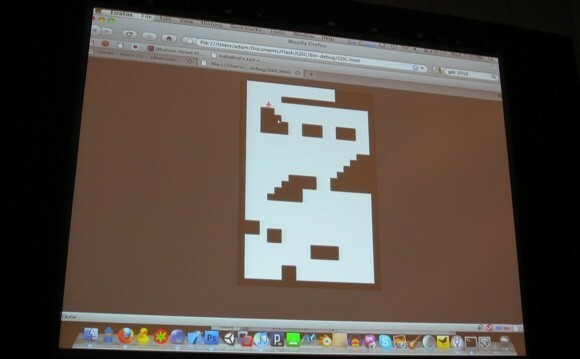 It can help developers rapidly prototype Flash games in an iPhone format. To show off the software, Saltsman hooked the computer he'd been working on into the projector, and showed off a quick little platformer game (as per the audience's request at the beginning of the 20 minute panel) called "Platformer (I guess)." The game was super simple (and buggy -- he had to tweak it a little bit as he played, and the little guy couldn't go downstairs), but it was a very nice working prototype of a possible touch-based platformer. Nothing you could sell, but as a demo for Flixel, it worked. We'll keep an eye out for both Gravity Hook HD and Flixel, and we'll try to corner the guys from Semi Secret later this week to try and talk to them both about their work on Canabalt and what they're up to in the future.